Scientists can tell several facts about us just from our teeth. For example, our teeth reveal our age, what we eat and drink, and even where on the planet we lived. Our teeth also indicate our overall health and give clues about a period of illness we may have suffered or times of great stress. In childhood we have 20 baby teeth, adulthood brings us 32 permanent teeth. The crowns of our baby teeth are already in place the day we are born. At about 3 to 6 months of age, baby teeth begin to break through the gums. Throughout childhood, the crowns and roots of adult teeth are already forming under the baby teeth. In the 1950’s most children received 25 cents from the tooth fairy after placing a lost tooth under their pillow. 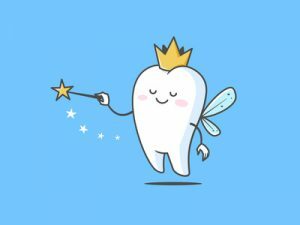 In 1998, the tooth fairy’s generosity increased to $1.30. According to Fortune magazine, the average lost tooth receives about $3.70, while the first tooth that is lost is worth a bit more, averaging $4.96. Scientists have found tooth brushing tools dating back to 3500 to 3000 BCE. The Babylonians and the Egyptians frayed the end of a stick to create bristles the scrub their teeth clean. However, toothpaste dates back even farther, to 5000 BCE invented by the Egyptians. If you would like to learn more you are welcome to call and book an appointment or fill out our contact form and click Send.